MINNEDOSA, Manitoba — Now that the hunt was over, Jim Marshall carried an armful of wigeon, teal, gadwalls and mallards into the duck cleaning room and proceeded to gut and bag them. While some birds were placed in plastic bags for freezing, with each hunter’s name and license number printed on the outside, a few of the birds were set aside for further cleaning. Dark meat was gleaned from the bones and washed under cold water. In assembly-line fashion, Scott Scherer took chunks of cleaned duck meat from Marshall and wrapped them in bacon. About an hour later, we gathered around a gas barbecue in the parking lot of the Gateway Motel and cooked ducks three ways — barbecued with bacon, in a Cajun stew and in a Chinese stir fry with vegetables. A bottle of red wine was uncorked and, under a blazing display of northern lights, we feasted. Other motel guests drifted by, perhaps lured by the smell of bacon-wrapped duck cooking on a barbecue. Otherwise, our merry band of camo-clad hunters didn’t raise an eyebrow, mostly because the owners of the Gateway, Kathleen and Scott Martin, love it when hunters are their guests. As any hunter can attest, it is not always that way It’s sometimes tough to get good accommodations when your boots are muddy and a wet Labrador or English setter is your companion, m the old days, rural motels in Minnesota probably opened their arms to hunters, but lately I’ve found some motel owners aren’t exactly hunter-friendly. Three years ago, when the Martins moved from Devon, England, to the pastoral town of Minnedosa, they didn’t realized they’d settled in the heart of Canada’s duck-hunting region. Some of their hunting guests were pretty rude, too. Scott realized hunters cleaning their ducks in the bathtub were plugging his bathroom pipes. Knowing they needed the customers, the Martins launched a plan to keep their duck hunters happy, but also keep them living within the rules. Scott’s duck-cleaning shed is a beauty, with a sink, running water, chest freezers and garbage cans. Later, the Martins added the gas barbecue because they realized some of their hunters returned from a field after most of the town’s restaurants closed. They decided to continue to allow dogs in the rooms. “Most of the hunters are good with the dogs in their rooms because the dogs sleep in the crate. The hunters are far more responsible than the average (people on holiday).” That the Martins have learned the idiosyncrasies of duck hunters is remarkable in itself, since three years ago they had no idea that they’d be motel owners in Manitoba. It started with a real estate agent who dialed a wrong number in England and ended up with Scott, a social worker, on the telephone. The agent eventually convinced Scott and Kathleen to visit Manitoba to look at motel properties. An intense hockey fan in a soccer-crazy nation, Scott saw a visit to Canada as a opportunity to see “proper hockey,” never thinking he would move. “I’ve always liked Canada,” said Scott, with a thick English accent, “because it has hockey. It was so hard to get proper hockey on TV in England. I remember looking at the motel the first time we came here and thinking, ‘Wow, I get to watch the Brandon Wheat Kings (the local pro team) tonight! '” But with Kathleen’s experience in motel management, finances and catering, the Martins bought the Gateway and moved to Minnedosa. The once-dilapidated motel has been remodeled, and Kathleen has opened a new restaurant that stays open late enough for the hunting crowd- The Martins’ parking lot gets hunting rigs with licenses plates from Minnesota, Wisconsin, and Missouri- Maybe it’s the smell of barbecued duck that brings ’em in. Call the Gateway Motel at (204) 867-2729. Or visit the Martins online at www.gatewaymotel.ca. 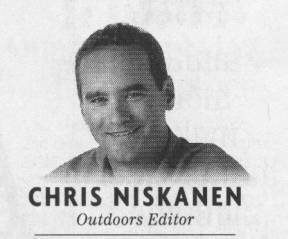 Chris Niskanen can be reached at cniskanen@pioneer-press.com or (651) 228-5524.